I got some email and there was a post further down in the blog that there is fairly good evidence that a group or a pack of wolves has formed in Eastern Oregon near or in the Wallowa Mountains. The Wallowas are close to Hells Canyon which is the Oregon-Idaho border. There are wolf packs near Hells Canyon on the Idaho side. While it’s doubtful wolves would cross Hells Canyon in the summer (it may be the hottest place in Idaho at the bottom), they could easily swim the Snake River, at its bottom, in the winter. The story in in todays Oregonian. Read article. I have received emails and oral reports of wolves in the Wallowas, mostly near Halfway, OR for several years now. As a native Oregonian living in Idaho’s hinterlands, I am happy to hear the news that a wolf pair may have pups in the Wallowa Mts. There’s a lot of work ahead to make a place in Oregon for wolves. I would urge anyone with the means to step up and offer funding to try and create some places – both on public and private lands – that could be freed from cattle and sheep. Otherwise, wolves will not make it in Oregon. Maybe in the wilderness of the upper Minam River, maybe not. Since I posted the story from the Oregonian, Ed Bangs sent out his weekly “Gray Wolf Recovery Progress Report.” He gives more details on the matter. I am happy to see evidence of wolf dispersion beyond the tri-state area that is not in the form of dead wolf. I have heard hopeful reports of wolves in northern Utah as well. There is still plenty of great wolf habitat in the West, such as portions of Oregon and Washington, northern Utah, and Colorado. Wolves are world class travelers, and would ordinarily have no trouble reaching suitable habitat, but the human guantlet is going to be formidable… wolves in Wyoming that have wandered south of the Tetons have been invariably “controlled’, and crossing central Oregon to reach wilderness areas in the western part of the state will be difficult. Personally, I believe that if/when wolves enter Colorado, they will probably come via Utah, as southern Wyoming is a rough place for wolves. I am writing a paper on wolf issues in the Hells Canyon National Recreation Area. If y’all have any leads on info it would be great. Thanks. 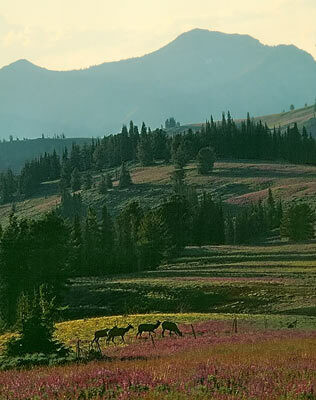 I witnessed an adult wolf chasing a very healthy adult mule deer doe in the wilamette NF in November of 2004. I am a veterinarian and am experienced in assessing the size and species of canid, in addition, I have spent several weeks in Yellowstone observing wolves. I certainly know the difference between a wolf and a coyote. This wolf crossed my path at a run, in a densely forested area apx 30 feet in front of me, just seconds after the doe passed. I made several phone calls to report the siting to state wildlife officials, though I’m not sure that they believed me. I don’t doubt that you might have seen a wolf. After all, the “mystery” wolf showed up in Eastern Montana, far from the other populations. DNA testing showed it was not born a wild wolf, but had been released. The same could be true in Western Oregon. I think the chances are small, but not nonexistent that it could be an Idaho disperser, but it would have to travel over a lot of hostile country to make it to the Williamette NF. It is a much more difficult proposition for an Idaho wolf to make it to the west side of Oregon. I would think any wolf would try to settle in NE part or Oregon where there is a lot of prey. What color was the animal you saw?